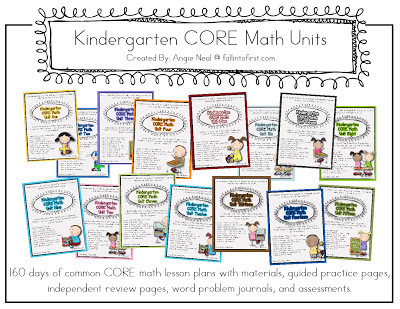 I just finished uploading Unit 16 Kindergarten CORE math to TpT! These 16 units cover ALL the kindergarten CORE math standards. Creating these units has taken me all year and has been a huge task and I am so happy they are finished! "Thanks for taking the time to create something so much better than any company could ever! :)"
"Absolutely love this my school has no curriculum and I have an hour and 15 minutes a week for a break. This is a life saver. I just found it so I will be starting it in the middle of the year. No more staying up until 3am. And no more 10hrs of weekend time at school." "I love this program! My kids are doing better than ever this year!" "I am so thrilled to have yet another math unit that is incredibly organized and age appropriate and useful!" "These are great, it is amazing the difference I have seen in my students since starting to use these. I will continue to buy them all, thanks for all the hard work:)"
"This is such an outstanding addition to my core math curriculum. Truth be told, I actually rely on it more than my out-dated curriculum. This meets the common core better. Thank you for all your hard work!!!" "Thank you so much! I would be floundering without your help!" Wanna know what all the fuss is about? Each unit has a Math Journal with 10 days of word problems. (Sample from Unit 15) The word problems address addition, subtraction, comparing numbers, measurement and decomposing numbers. Each unit has 10 days of lesson plans with materials and printables. Each unit has 10 days of guided practice and independent practice pages. (Sample page from Unit 16) The independent practice is a spiral review so students are continuously reviewing all the kinder CORE standards. Finally, each unit has an assessment! I have created a Scope and Sequence for all 16 units, just download the preview on TpT to have a look. If you have any questions please don't hesitate to ask! I also have first grade units and I am now going to begin working on SECOND GRADE! Hello I owuld like to buy the units from number 10 up to 16 but I dont know how to do it, Can you please help me with this matter? I love what you have made. I am still getting familiar with the common core. I live in Louisiana does it align with what you have made for Kindergarten?